Founded in 1977 Creative Music Productions (CMP Records) had as its original mission the recording of the most interesting, contemporary and creative jazz talents of the day. Never deflected from this path the label formed strong relationships with artists who in many cases were to become touchstone talents of the art of creating music. 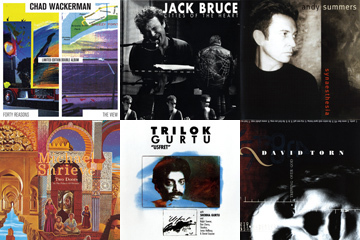 From early days artists including Trilok Gurtu, Richie Beirach, Glen Velez, John Bergamo, David Liebman and the extraordinary talent of Joachim Kuhn flourished within an atmosphere of mutual respect between artist and label. Following the creative muse CMP ventured into World Music but gave the artists total respect by recording on location in their countries and only to the highest professional standards. This commitment to authenticity produced the CMP3000 series with its own instantly recognized artwork. Many recorded by Walter Quintus and including recordings by The Heavenly Orchestra of Bali, one of a number of Gamelan music which held a peculiar fascination for the label. In fact the CMP3000 Gamelan recordings are a precious resource to all lovers of that form of expression. Other titles feature Samulnori, produced by Bill Laswell, and Shoba Gurtu mother of Trilok and a big influence on him. Latterly CMP developed a rockier side and after an absence of time gave the world new recordings by Jack Bruce. Also included were recordings by Mick Karn and David Torn. With the new opportunity presented by digital distribution the CMP Records catalogue is once more fully available. It has even been possible to include some of the original releases that were only issued in vinyl format. CMP is a record lovers dream and now available to be explored and enjoyed.